Some 31% of Americans who use a mobile banking app access the service at least once a day and more than four in five use it once a week or more, according to Bank of America’s latest Trends in Consumer Mobility Report (PDF). 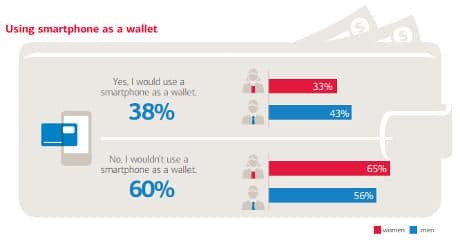 Six in 10 respondents are not yet comfortable with the idea of using their smartphone as a wallet in the future, however, the survey found. The report found 81% use their mobile banking app to check their balance, 49% to transfer funds between accounts and 48% to pay bills. Despite the availability of mobile banking, the majority of respondents continue to use bank branches, the survey found, with 84% of respondents having visited a bank branch within the past six months. Only 23% complete the majority of their banking transactions at a bank branch, however, with 47% using either their mobile or online as their primary method of banking. Overall, almost two thirds of respondents to the survey have at least tried mobile banking and 90% make use of online banking. Meanwhile, 58% of mobile banking users have used mobile check deposit, the survey found. Of those who have not used mobile check deposit, more than a third are either not as familiar as they would like to be or are unsure how to use it. More than one in five prefer physically handing checks to a teller and 27% reported they just don’t have any checks to deposit. When it comes to mobile payments, 60% of respondents are not yet comfortable with the idea of using their smartphone as a wallet in the future, with men reporting a higher comfort level than women (43% v 33%). Nearly four in 10 respondents would not be comfortable using their phone to purchase something at checkout, but 6% do currently pay at the register with a mobile phone. Men are more likely than women to be comfortable using their smartphone to make a purchase at a checkout (39% v 30%). When asked which payment method is the most appealing, about 63% selected traditional payment methods such as check, credit card or cash, while 33% are partial to alternative payment methods, such as an all-in-one card, digital currencies and mobile or social.